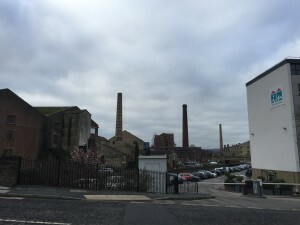 Note: this is the final part of a 3-part blog reflecting on a meeting at the headquarters of Incommunities, Bradford’s main social housing provider, last Friday (11th August). The context is outlined at the beginning of Part 1. As discussed in Part 2 of this blog, both Incommunities and their tenants face significant challenges in the form of housing stock that is (to fudge our language) less than ideally fit for purpose. It’s difficult to know what can be done about some of these issues without a change of policy at government level, leading to significant investment in new buildings. 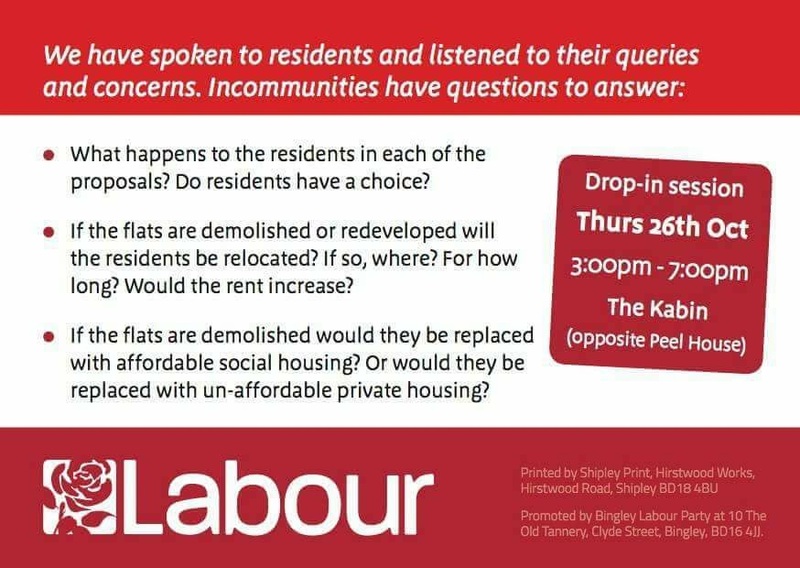 Leaving aside these bigger questions, though, my next question is whether — within the parameters of what a housing association can control, and is responsible for — more might be done to mitigate the daily problems faced by tenants? Or put another way: if tenants are to be made responsible for their “lifestyle choices” (see Part 2 discussion), who is holding Incommunities to account for its management choices? Because it seems clear that their existing procedures have not always served tenants’ needs as well as might reasonably be expected. 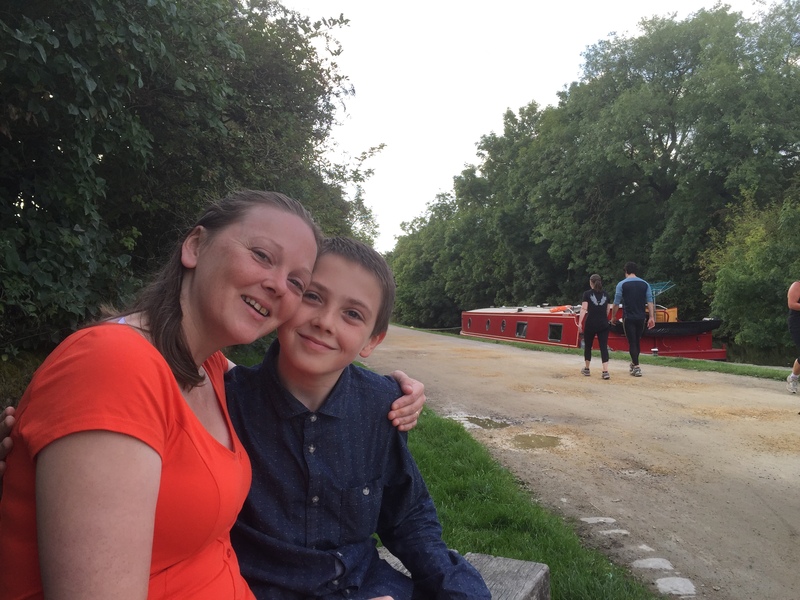 Jenni’s GP wrote on her behalf in 2010, noting her son’s coughing (since diagnosed as asthma), and asking that reasonable steps be taken to improve the family’s housing conditions given her reports of damp and mould. Having received no response from Incommunities (hereafter, IC), Jenni asked her GP to write again in 2012. She also went to her local councillor and parish priest, both of whom intervened on her behalf. These interventions led to a meeting with IC complaints’ staff at Jenni’s flat, during which a long list of necessary repairs and improvements to the flat’s fabric were discussed, all of which Jenni minuted herself. (These were all within the realms of the kind of maintenance that a tenant should reasonably expect of a landlord.) However, during this meeting, Jenni’s priest was “astonished” (his word) by the fact that the IC staff members had brought no clipboard, notebook, or any other means to record the outcomes of the meeting. His impression was that it was not being taken seriously. Following this meeting, there were sporadic visits to the flat from various workmen during the summer of 2012, often without appointment and completely unannounced. They made good some of the necessary repairs, but many of the other ‘agreed’ matters were left unaddressed. Moreover, some of the repairs that were carried out were done poorly and inadequately: e.g. poorly-installed damp-proofing; ill-fitting floor tiles that lifted when trodden on; a new window that leaked rain. Jenni found that her attempts to contact IC staff about these issues resulted in her calls not being returned. In the spring of 2013, with IC still unresponsive, Jenni tried contacting her MP, Philip Davies, about the condition of the flat. 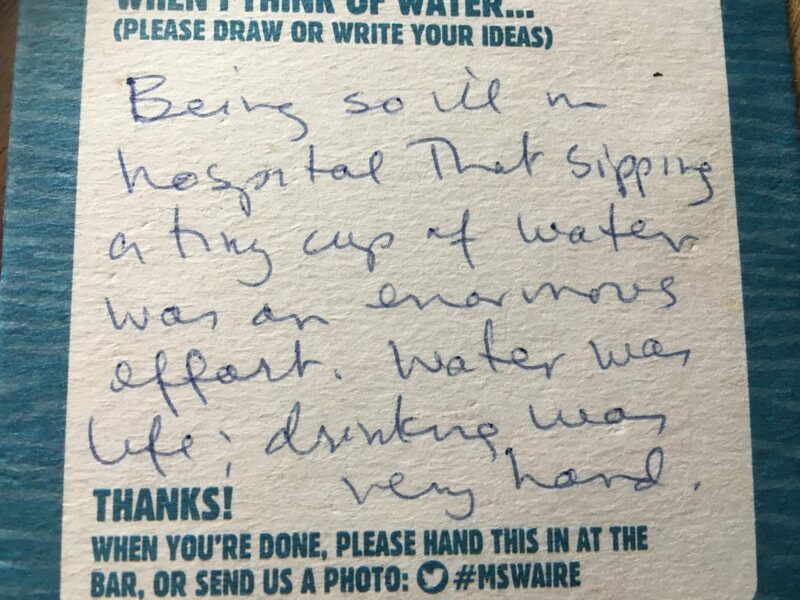 He wrote to Geraldine Howley, as IC’s Chief Executive, and this led to another meeting at the flat — this time with a member of their staff who did take careful notes about the long list of matters that needed addressing (including, for e.g., replacement of the leaking window installed only the previous year!). He shared this action list with Jenni via email, then went on holiday. And then nothing happened. 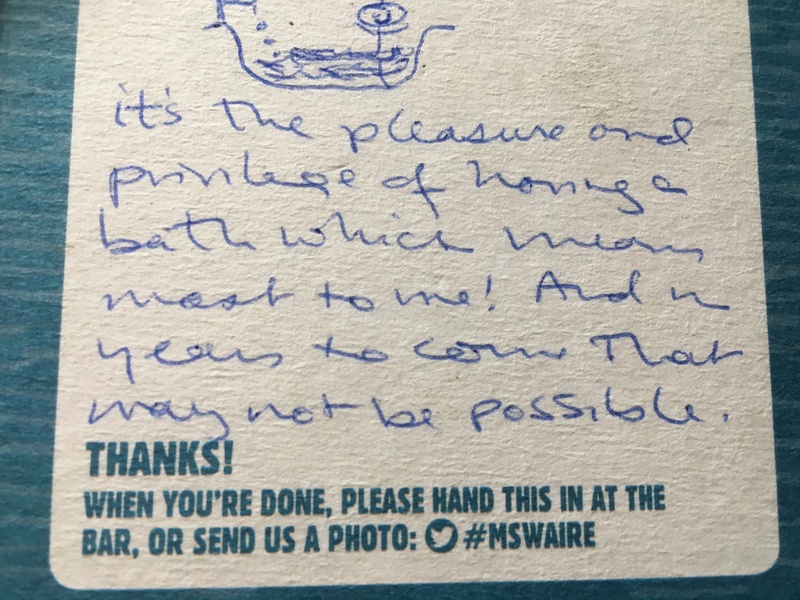 In desperation, later that summer, Jenni wrote again to Philip Davies, who wrote again to IC, and finally some action was taken about the most pressing matter — the mould on the wall of her son’s bedroom. (Note: on the other side of this wall is a ventilation shaft serving the whole building – the temperature of which is beyond the control of this family’s “lifestyle choices”!). Thermal boarding was installed over the existing wall (as seen in our film), and new damp-proofing was added. Promises were made that IC staff would revisit with a damp-meter, in future months, to check on whether the damp had returned. But nobody ever came. The workmen who came in 2012 and 2013 did not provide any redecoration to parts of the flat where they had done work. For a patch of wall where they had plastered over wallpaper, the family was provided with a tin of paint and left to get on with it (ie painting over wallpaper). After all this, Jenni more or less gave up hope of getting anything further done. Last year, when I made our short film about her case, she described movingly on camera how she had simply felt beaten into submission. Jenni is grateful for this recent work, but points out that, whenever damp inspections have been carried out, it has been in the summer months – when condensation is much less of a problem than in the cold winter months. One assurance that Geraldine offered during our meeting was that a fresh inspection will be organised for the winter. So progress is being made, and indeed Geraldine and Adrienne were keen to impress on us that there have been recent improvements to Incommunities’ service strategies which they expect will bear fruit in future months and years. They pointed to the recent Fun Day at Crosley Wood (discussed in a previous blog) as evidence of this refreshed approach. Hopefully, then, things are indeed on the up. During our meeting on Friday, Paul Barrett and I asked whether — perhaps — part of the problem here lies with Incommunities’ insistence on referring to its tenants not as tenants but as “customers“. Doesn’t such language run the risk of entrenching a culture in which the relationship between housing association and tenant is simply one of financial transaction — of paying rent in exchange for a roof over your head? Given that most social housing residents have little choice about which roof they are paying for, the consumer metaphor breaks down pretty quickly. Put it this way: if I’ve bought something from a shop that doesn’t work properly, I will take it back and request a refund or replacement. The shop will comply, in the interests of ensuring that I return to their store next time, rather than choosing a competitor: that’s good customer service. 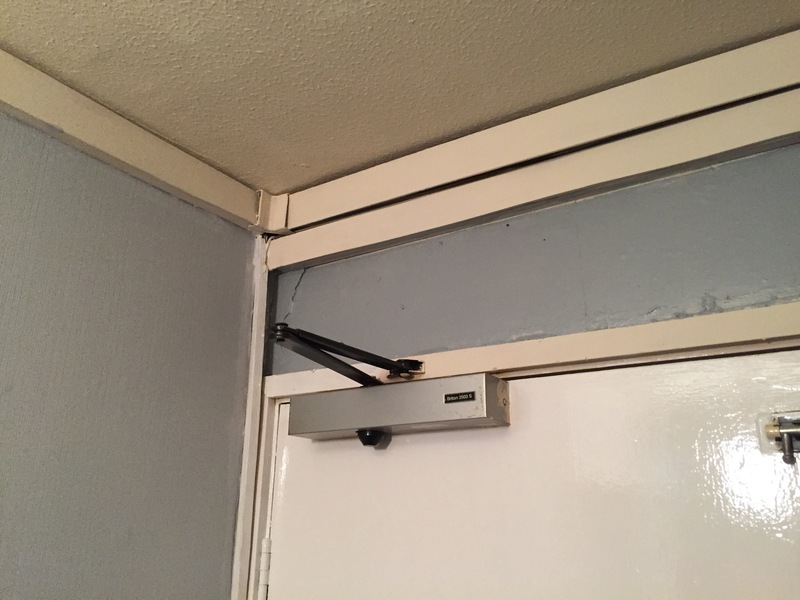 But if something in a flat at Crosley Wood doesn’t work properly, the tenant can’t go anywhere else (unless they have the financial wherewithal to move into private rented accommodation). So there is no obvious incentive for Incommunities to do anything about the problem very quickly… other than the general moral incentive of wanting to do the right thing. Back in the days of council housing, the council was answerable to its voters, many of whom would be living in council houses. But today, housing associations are accountable only to their regulator — the same regulator that demands all costs to be passed directly to the tenant, thereby inflating the price of some flats above their market value… (see Part 2) For all these reasons, the “customer” label seems less than apt for social housing tenants. Where stigma lies, I think, is in the attitudes and assumptions that are often held about social housing tenants (attitudes that have often been exacerbated by the popular media and by political rhetoric about “skivers versus strivers”, etc.). And indeed, there’s no point denying that an estate like Crosley Wood does house a number of tenants whose disadvantaged lives have led to mental health issues, or substance abuse problems, or who have been guilty of anti-social behaviour, and so on. I can imagine that working for Incommunities must sometimes be very difficult, if you’re dealing with people with complex needs, or when you get a faceful of grief from someone who is angry about their living conditions, or about the neighbours who have been put in next door to them, or a hundred other things. It might be very easy, after you’ve been in a few such confrontational situations, to start imagining that every tenant is a “problem case” of some sort. Even when they are not. And thus a vicious circle keeps turning — because if staff become habitually defensive or confrontational, this will naturally exacerbate the frustration of tenants. There was a telling moment, during our meeting on Friday, when this “oppositional” dynamic came into focus quite sharply. 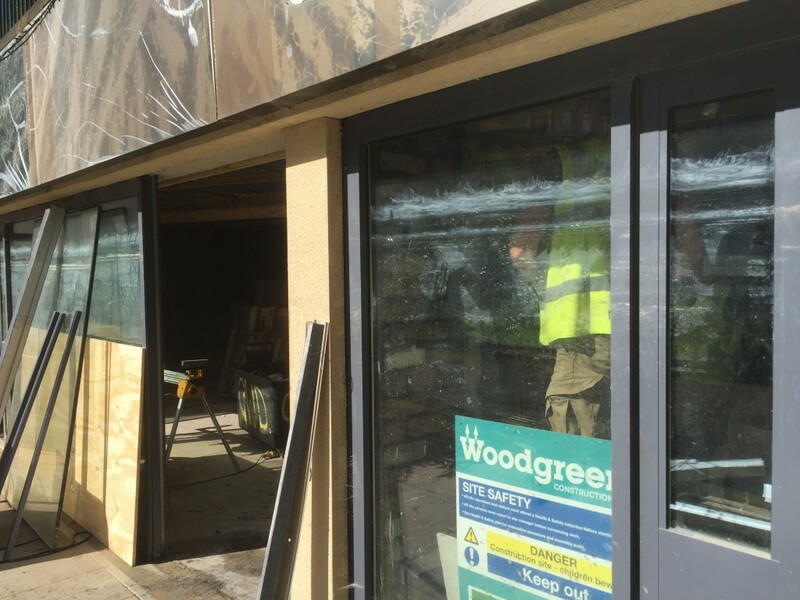 Incommunities recently held a “fire safety surgery” at Crosley Wood, which was intended (in the wake of the Grenfell tower fire in London) to try to reassure and inform residents about their own situation. Anticipating that there would be lots of demand for discussion, Incommunities sent a sizeable team of seven or eight staff members to this event — only to discover that they outnumbered the residents who attended. But as Jenni explained, the large turn-out was perceived by residents as Incommunities coming in mob-handed. She felt that this had prompted a some people to stay away from the meeting — perhaps feeling that they would simply be fobbed off with pat explanations. That kind of distrust and suspicion is perhaps understandable given the track record of poor service that many residents have experienced. And yet it’s equally easy to see why, from an Incommunities point of view, this low turn-out might be perceived as a show of apathy towards a constructive attempt at dialogue… And so the cycle of misunderstanding continues. Paul Barrett, from Shipley’s Kirkgate Centre, was in attendance at the portacabin meeting, and he pointed out during our meeting with Geraldine and Adrienne that — from his point of view as a community development specialist — the move towards a constituted residents’ committee was premature. It also imposed an undue burden of responsibility on those few residents who had turned up to the meeting, and were thus placed in keyholder roles. Adrienne responded by acknowledging that Incommunities are a housing provider, not community development experts, and that mistakes might have been made here. 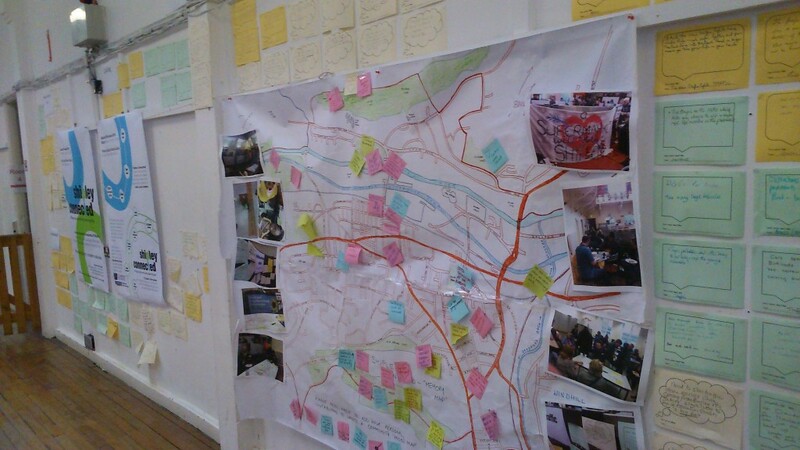 She then explained that Incommunities is currently developing a “partnership network” scheme, whereby community centres such as Kirkgate Centre will be approached to help advise on community development strategies, and to develop better collaborative working — towards new initiatives that might enhance community and individual “resilience” in the face of often difficult circumstances. I should stress that I do not think that this is what Adrienne intends by this initiative. My impression was that she was listening carefully to what Paul, in particular, had to say, and that she was genuinely interested to further the conversation beyond this particular meeting. Perhaps there are, indeed, ways to share complementary knowledge bases, and to open up dialogues that can overcome ingrained, oppositional suspiciousness of the sort I described above. In short, perhaps there are ways for us all to take shared responsibility for improving the situation, rather than simply passing the buck or blaming other people. Shared responsibility is important, after all. To take an example from another set of issues that I’ve tackled elsewhere on this blog — flood risk management — the fact is that individual house-holders at flood risk do need to improve their personal resilience to such threats. 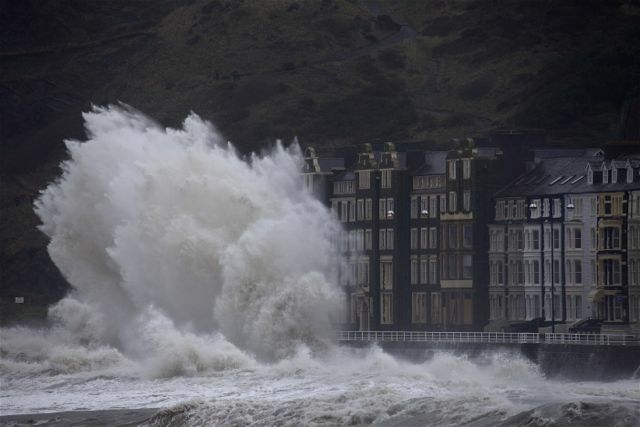 There’s no point in expecting the government, or anybody else, to march in and make all the necessary alterations to your home that would minimise the danger of flood damage (how many of us would want the government marching in?! ), so you have to take some responsibility yourself. To do your part. 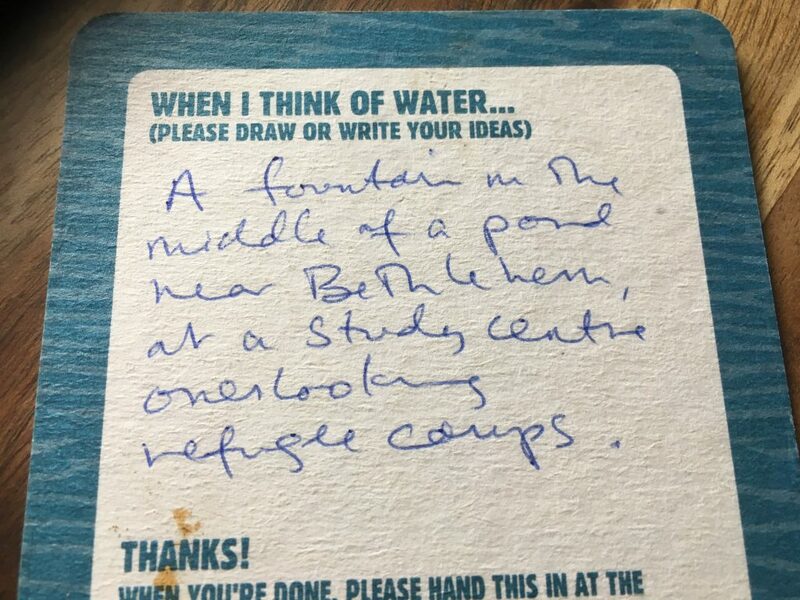 (And in Jenni, we see someone more than willing to do her part: she lives eight floors up, well out of reach of the River Aire, but at the start of our film, she describes her own response to the 2015 Boxing Day flood, on behalf of other people…) But such individual citizens’ responses need to be mirrored and complemented by the responses taken by statutory and voluntary organisations — be they local councils, housing associations, community centres, or whomever. We all of us need to listen, and learn, and gain new perspectives on the issues at hand. To conclude, then: at the risk of over-stating my problem with that word “customers”, I would suggest that the marketisation of social housing has had negative impacts on residents and providers alike, by imposing an artificial dynamic of supply and demand… But this housing provider is called Incommunities, not Insupermarkets, and it seems to me that listening, learning and working together is surely the only way in which to improve community relations, and with them, the relationships between landlords and residents. My thanks, again, to Geraldine Howley and Adrienne Reid for taking the time to speak with us in such a full and constructive way. Responsibility for any inaccuracies or misunderstandings in these blog texts is entirely my own. Note: the following has been edited since it was first posted in August, in order to allow for ‘right of reply’ from Incommunities. Social media notifications about the blog were not circulated until early September, after edits completed. This last Friday, August 11th, we had the opportunity of a very interesting and informative meeting at the Shipley headquarters of Incommunities – Bradford’s main social housing provider. Their building sits right next to the Leeds-Liverpool Canal, as indeed do the three tower blocks of the Crosley Wood estate, Bingley, which we were there to discuss. 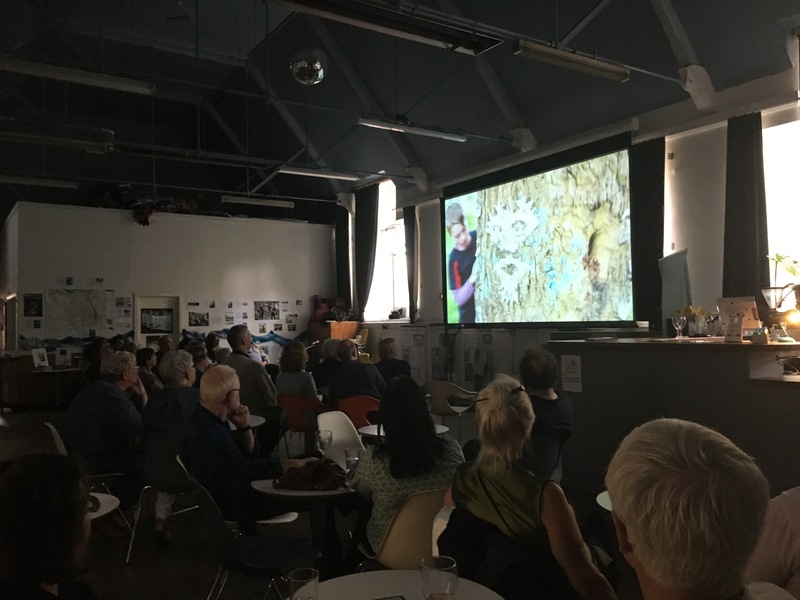 “We” were myself (Steve Bottoms), Paul Barrett (community development director at Shipley’s Kirkgate Centre), and Jenni Mynard – a resident at Crosley Wood who is the subject of our short film High Rise Damp, and of a blog post I wrote more recently, following the Grenfell tower disaster in London. This meeting with the Chief Executive of Incommunities, Geraldine Howley, OBE, came about after I wrote to her – and to various members of the housing association’s board – with DVD copies of the film and a link to the blog. I am very grateful to Geraldine, and to her colleague Adrienne Reid (Assistant Chief Executive for Neighbourhood Services) for taking the time to speak with us, in the interests of building dialogue and understanding. Indeed, we were given considerably more than the hour initially timetabled, which was much appreciated. I will confess to some disappointment on discovering that Geraldine (I hope it’s OK to use first names) had not actually watched our 15-minute film. That is, of course, perfectly reasonable, insofar that Chief Executives of large organisations are extremely busy people, who often need to work from summaries rather than first-hand sources. 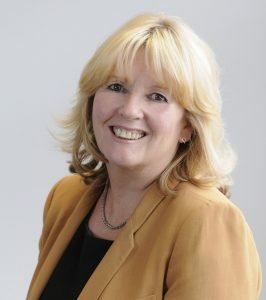 My disappointment lies simply in the fact that, while Geraldine had clearly been briefed on Jenni’s case (and had a number of documents about it in front of her), she had not taken the opportunity to consider Jenni’s story from her own point of view – as a tenant, as a parent, and as a citizen. That story is, I think, indicative of many people’s experiences, and it’s a perspective we don’t often hear. We had hoped that it might be heard at Incommunities. That point aside, the meeting was productive and informative. I’m going to try to summarise what was discussed in three, inter-linked posts. This first one (below) looks specifically at the fire safety questions that have arisen for tower blocks, post-Grenfell. Part 2 then takes a wider perspective on the architectural problems with “brutalist” concrete towers such as those at Crosley Wood, and indeed at the burden of costs that they impose on social tenants (we were alarmed to learn that these can be higher than in the private rented sector!). 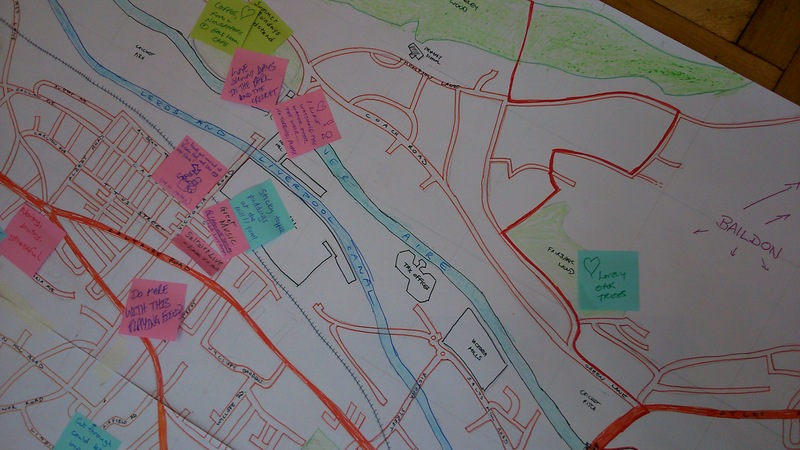 Part 3 then looks at questions of shared responsibility — and the extent to which Incommunities can be seen to be working with social tenants to improve their living conditions (or not). Some significant terminology used by Incommunities, such as “customers” and “resilience”, also comes under examination. As noted above, our film with Jenni was not discussed at the meeting. However, it became clear that my previous blog post had caused some concern at Incommunities, not least because of my use of a photo of the burning Grenfell tower at the start of the blog, underneath the title “Life in a Bradford tower block”. (I promised to look at this again, but on reflection I’m going to leave it as is: I think it’s clear from the first paragraph that the image is of the London fire: there is no suggestion that one had taken place in Bradford.) There was also mention of inaccuracies in the blog, which I have promised to amend if they are pointed out to me. I am concerned to be as accurate as possible. This is in line with of the current Stay Put Policy for tower block fires, as agreed with West Yorkshire Fire and Rescue Service. The idea is that it is generally safer for residents to stay put in their flats during a fire than to be seeking to escape down the single, narrow stairwells that exist in blocks like those at Crosley Wood — just as firemen might be seeking to come up. The rationale here is that these flats are all designed as self-contained concrete boxes (concrete walls, ceilings, floors). Concrete is of course fireproof, so provided that doors are kept properly closed, it’s reckoned that it should be a good hour before a fire can escape from the flat it starts in. Within that hour, the Stay Put Policy assumes, the fire service should have been able to respond and extinguish the fire. This all makes a lot of sense, if other factors are properly taken into account. The reason that this policy did not work at Grenfell tower was allegedly (there is a formal enquiry looking into this) that the flammability of the exterior insulation cladding on that building had not been taken into account (there’s more on insulation in Part 2 of this blog). Incommunities checked very swiftly, post-Grenfell, that their Bradford blocks do not use the same cladding that had cost so many lives in London. That does not mean, of course, that the buildings are therefore definitively safe. It’s worth asking, for example, how water can leak so easily between floors (as Jenni vividly describes in our film) if these are sealed concrete boxes? But the good news is that Incommunities have now commissioned fully independent fire safety assessors (from Savills) to conduct a review of all their properties. This process starts later this week — from August 18th. 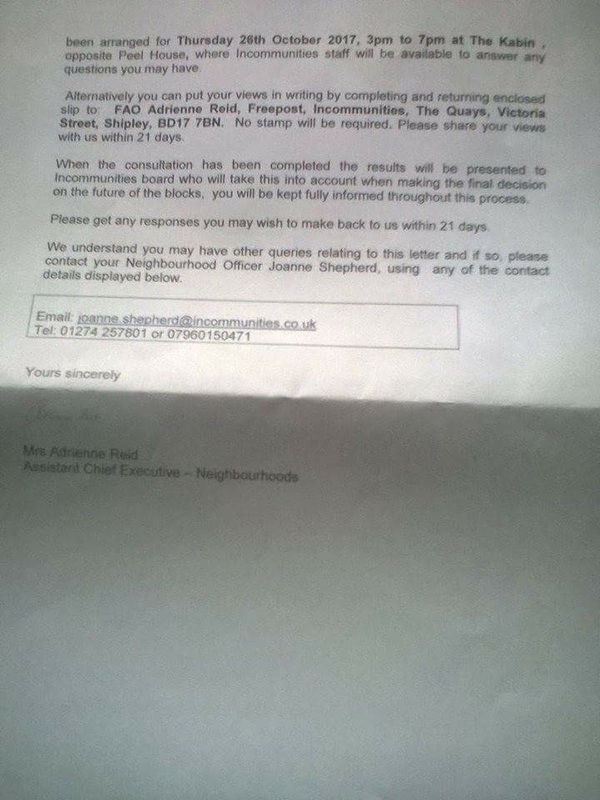 This is a major undertaking, given that Incommunities has over 1200 flats in 30 tower blocks around the city. During our meeting, it was suggested that this independent assessment would be conducted on a block-by-block basis. 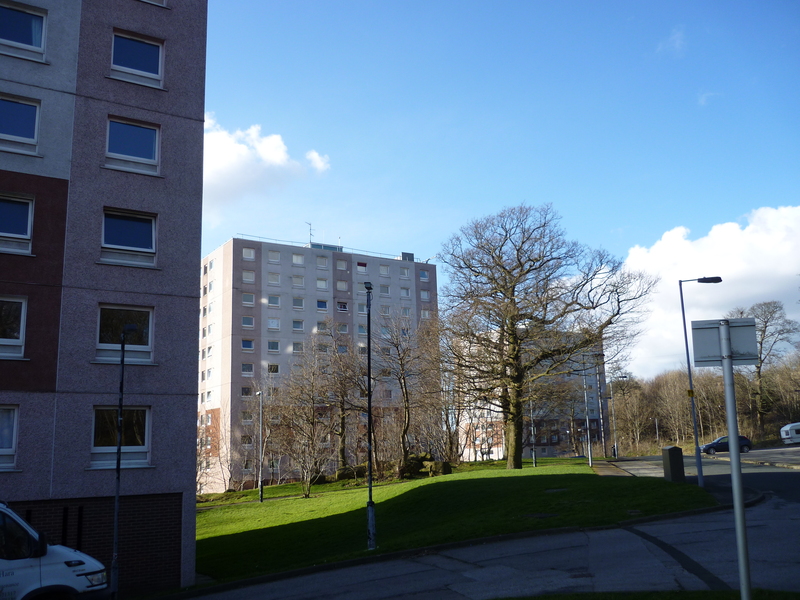 This concerned us somewhat, since our own (admittedly cursory) examination of two different, neighbouring flats at Crosley Wood, accompanied by an off-duty fire officer, indicated that there may also be fire safety issues on a flat by flat basis. 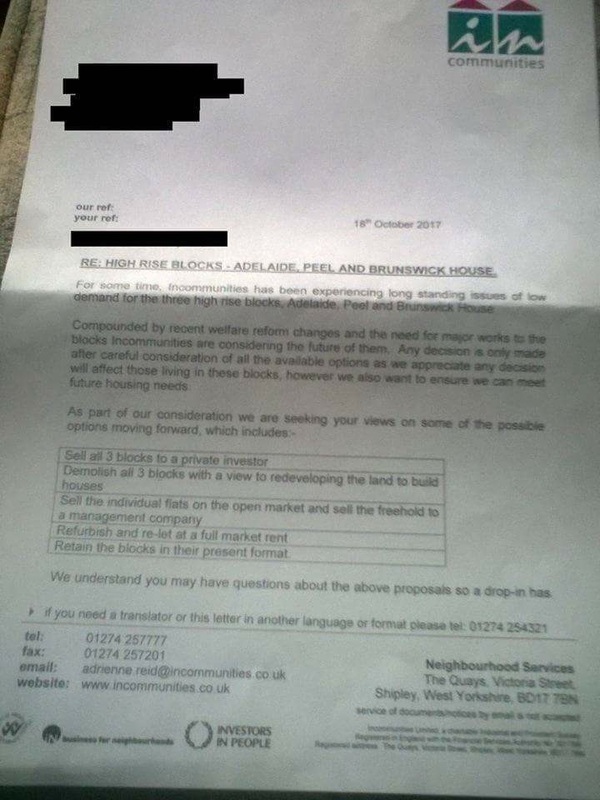 Harry Whittle – from the Incommunities Asset Management staff – has since clarified via email that “in fact individual flats will be surveyed”. Commenting on an earlier draft of this blog, Mr. Whittle also comments that problems with individual flats of the sort mentioned below should normally be addressed through “reporting of repairs by the customer”. 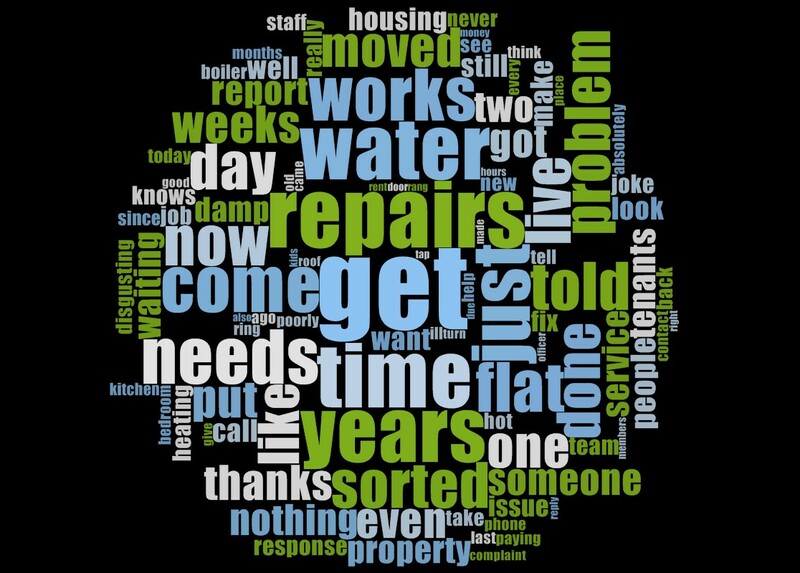 However, as discussed in Part 3, such reporting by tenants has not always been responded to in a timely fashion by Incommunities. And poor responsiveness can lead to a resigned, “why bother?” attitude among some. This is one example of the way that shared responsibility needs to be revisited and reassessed on all sides. 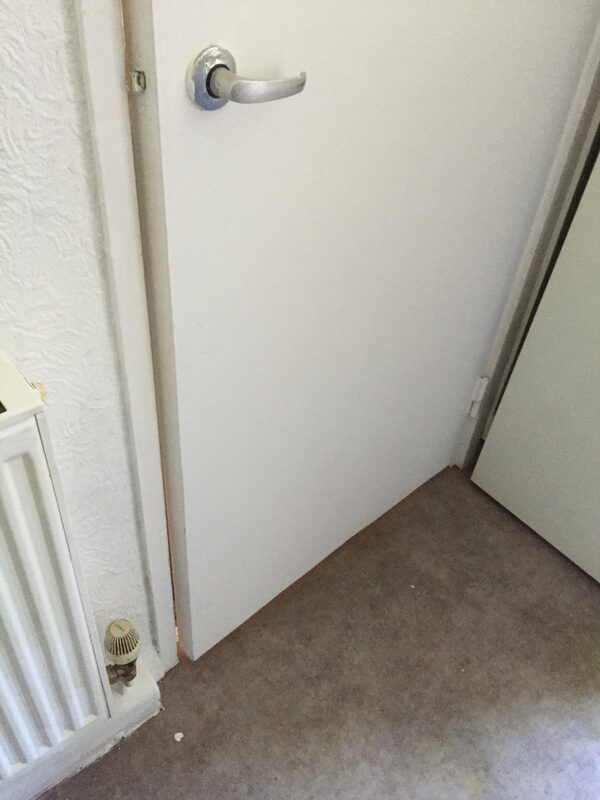 … this kitchen door, which is as closed in the picture on the left as it ever gets: it simply doesn’t fit the door-frame. As such, it compromises the principle that a kitchen (the most likely place for a fire to start) can be left to burn for around 20 minutes before it spreads to other parts of the flat (and beyond the flat after 60 minutes). 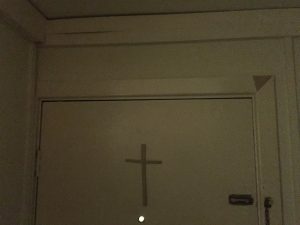 The tenant in question states that, in the twenty years she has lived in this flat, this door has never shut properly. The same tenant does have a proper closing device on the front door of the flat… another important fire safety measure (below). … but contrast that with the next picture, showing the inside of her neighbours’ front door. This one has no such closing device, and they don’t recall there ever being one in the 12 years they’ve lived there. 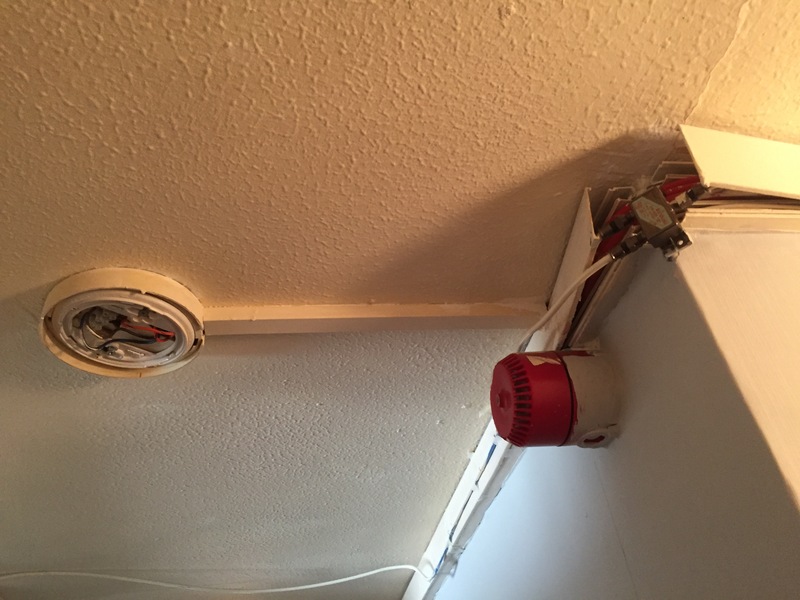 Harry Whittle, however, notes that “when checking smoke alarms the engineers are checking front entrance door closers”, so it looks like this is an issue which will be directly addressed in the near future. Notice in these pictures, also, the trunking adjacent to the ceiling, carrying various pieces of wiring. Because these flats have concrete ceilings and floors, wiring can’t be hidden within the walls as it would be in most homes, so has to be carried externally. That’s fine, from a safety point of view, if the trunking is metal (i.e. 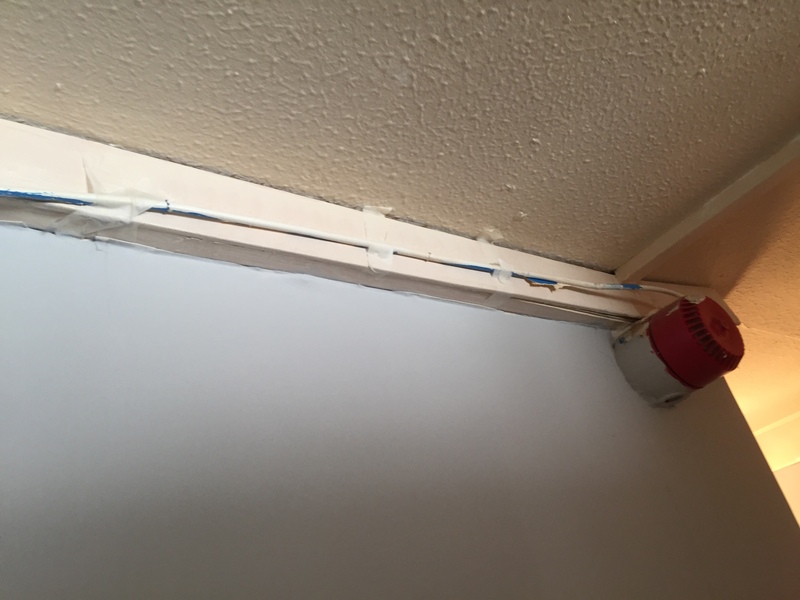 fireproof), but our fire officer pointed out several places in these flats where plastic trunking had been retrofit… as in the image below (where another wire has been casually taped to the trunking). 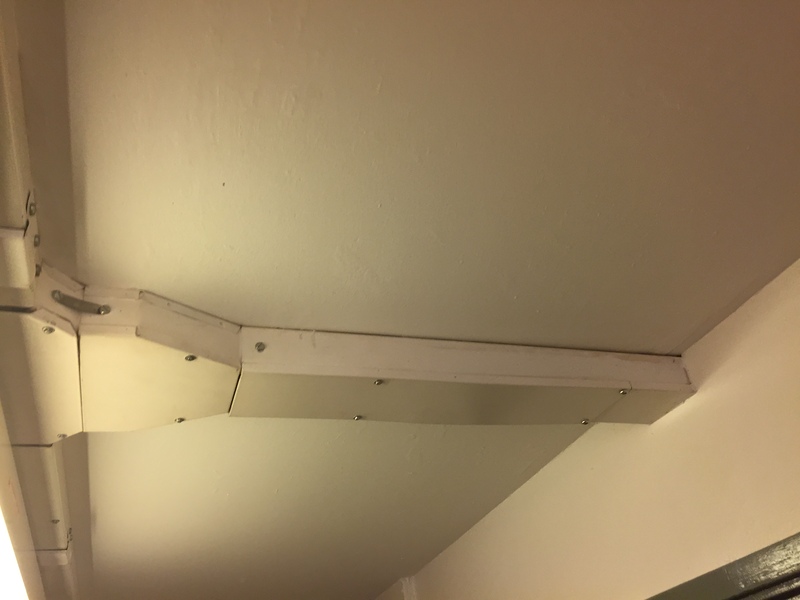 Apparently, such plastic trunking has proven very dangerous in fire situations, because it melts quickly in the heat, leaving wiring hanging down as a trip hazard for residents and firemen alike. Harry Whittle’s email response on this point notes that, “per IEE 17th edition regs 2015, plastic trunking can still be used.” If you check these regulations online, though, it’s clear that they have been introduced because several firefighters have lost their lives in recent years as a result of hanging wires. The regs specify that where “non-metallic trunking” is in use, “a suitable fire-resistant means of support/retention must be provided to prevent cables falling out in the event of fire” (my emphasis). In the picture above, there does not appear to be any such additional, metallic support… and indeed the plastic stuff is actively peeling off the wall at the corners (see “sounder” image, further above). Clearly this is an issue that will need to be looked at. 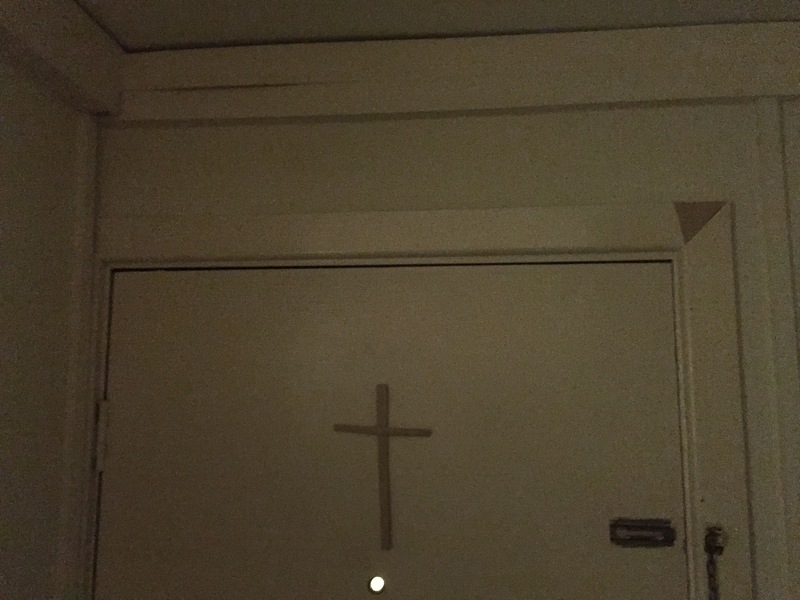 Our off-duty fireman also raised some concerns about this sort of metallic trunking, which carries wiring out of flats into the corridor to connect with the mains trunk to the left. Here, wiring has clearly been taken through the concrete wall, and our fireman speculated whether this might compromise the integrity of the flat’s “concrete box”. Harry Whittle’s response: “fire stopping works i.e. collars; intumescent putty are used to maintain this. However, again this is part of the Type 4 destructive survey.” This is the most rigorous type of fire risk assessment, apparently due to be carried out by Savills as part of the commissioned inspections. 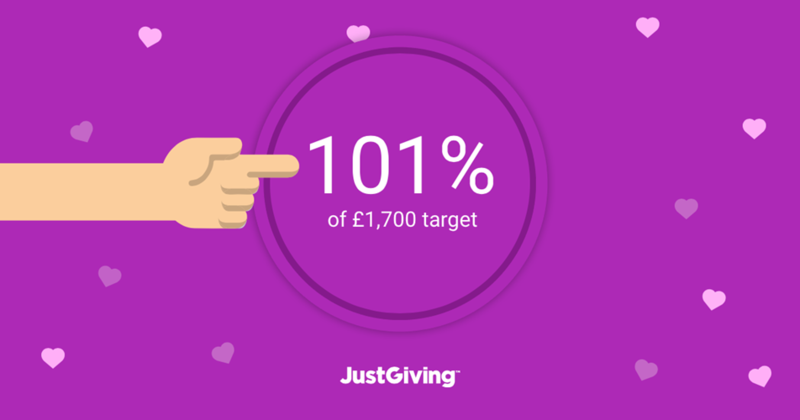 This brings us back to Jenni, and her experience of attempting to establish through the concierge service for her building (Peel House), whether anything was being done about recent fire scares. This concierge service, which Incommunities provides but which residents pay for through additional charges, has in Jenni’s experience proved less than informative. If they answer the phone at all (which, she says, the often don’t), they tend to be rude and unhelpful. Surely, though, if a (silent) alarm has been sounded centrally, the concierge service should be aware of this, and be able to reassure worried residents that appropriate action is being taken? Life in a Bradford tower block: It’s about citizens, not cladding. And yet there is absolutely something to see here. 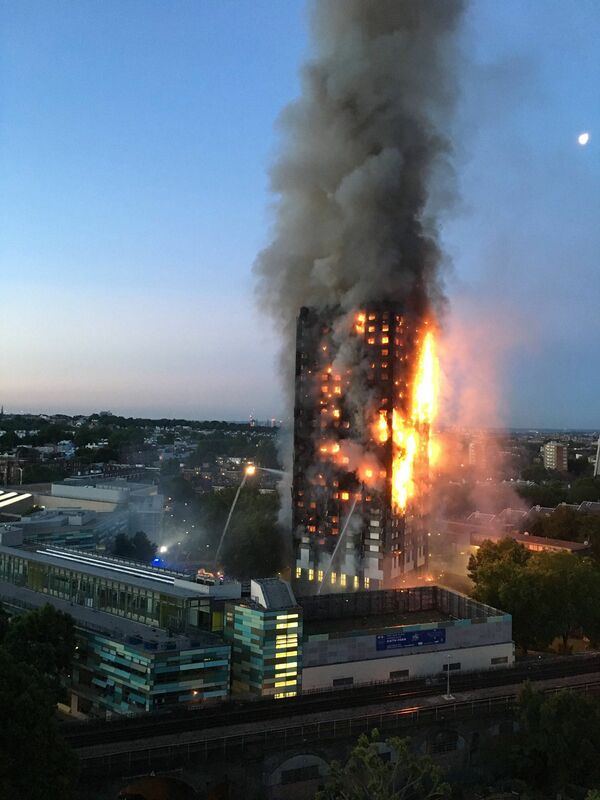 Because while Grenfell tower’s flammable cladding seems to have been the immediate cause of this fire spreading so rapidly and lethally, there had long been concerns that any number of problems with that building were potentially life-threatening. The residents of Grenfell Tower had been well aware of this for years, but found that their concerns were repeatedly “brushed away” by the relevant authorities. So let’s not confuse the symptoms with the disease. This is not a story about cladding, it’s a story about ordinary people not being listened to. It’s a nationwide pathology, and one that is only perpetuated by the cat-fighting at governance level about who did (or didn’t) do what when. When you’re shouting, you’re not listening. This is Jenni Mynard. She and her family live on the eighth floor of ten in Peel House, one of the three Crosley Wood tower blocks. 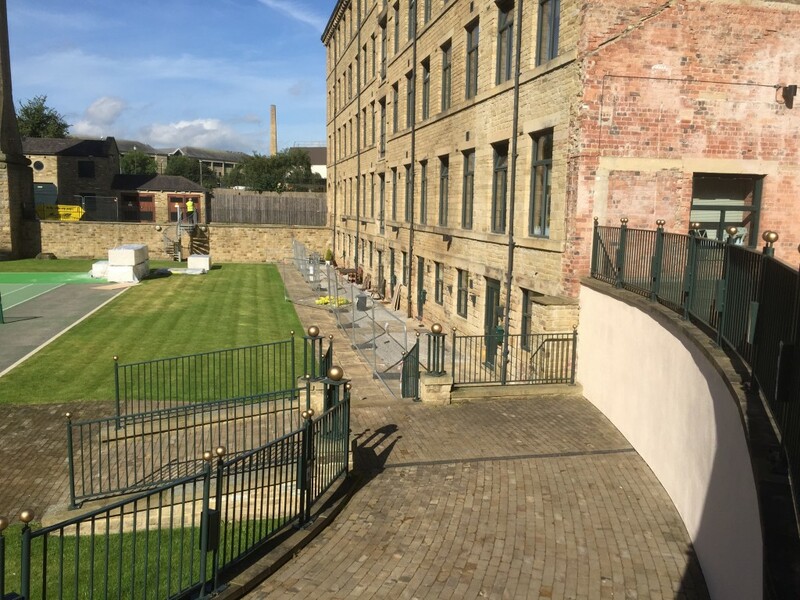 It stands right next to the Leeds-Liverpool Canal, which is why our Multi-Story Water project – working alongside Shipley’s Kirkgate Centre – became involved in a community engagement process there. 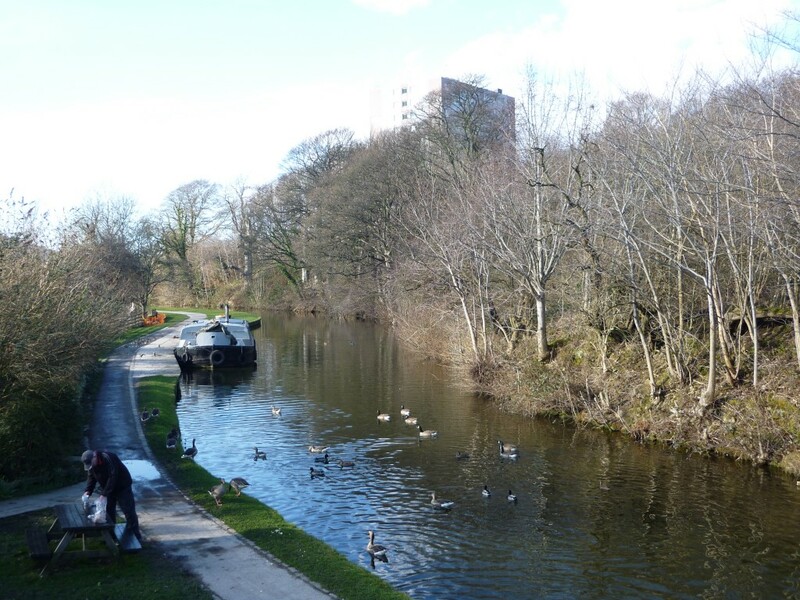 The canal, we’ve found, is experienced by residents as one of the few upsides to living on this estate. But residents at Crosley Wood also experience water in their lives in much more immediate and troublesome ways – in the form of persistent damp problems throughout the buildings, often manifesting as black mould. 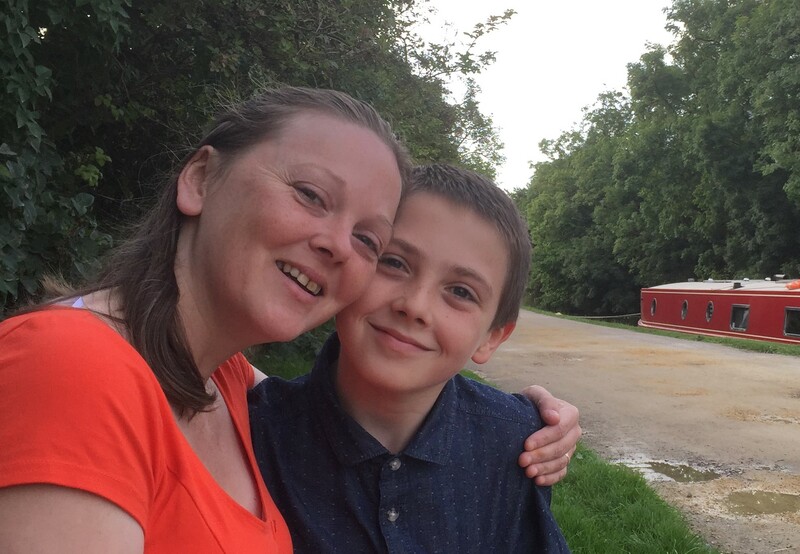 This poses serious health risks: as Jenni explains in the film, her son Dylan suffers from chronic asthma which is likely a consequence of the damp. Yet all her attempts to have the problem addressed or even taken seriously by InCommunities haveseemingly fallen on deaf ears. Making this film was my attempt to have her tell her story, for anyone who might be willing to listen, as simply and directly as possible. There is, unfortunately, nothing unusual or exceptional about Jenni’s story. That’s sort of the point. As Emma Dent Coad, the new MP for Kensington and Chelsea MP (whose constituency includes Grenfell Tower) remarked during her maiden speech to Parliament in the wake of the fire disaster, “I’ve seen housing conditions that are shocking… Homes growing toxic black mould… Chronic health problems such as asthma, with children being carted off to hospital at night.” Dent Coad has accused Kensington council of presiding over the “deterioration and perhaps even deliberate managed decline of social housing” in that borough. Making a similar point, another London MP, David Lammy (who personally knew one of the victims of the Grenfell fire, the acclaimed photographer Khadija Saye) has gone so far as to call it a case of “corporate manslaughter” – avoidable deaths caused by neglect and a lack of care. This image sort of speaks for itself. The word “thanks” does come up, but so too do “disgusting” and “joke”. And notice just how prominent that word “water” is in the mix. 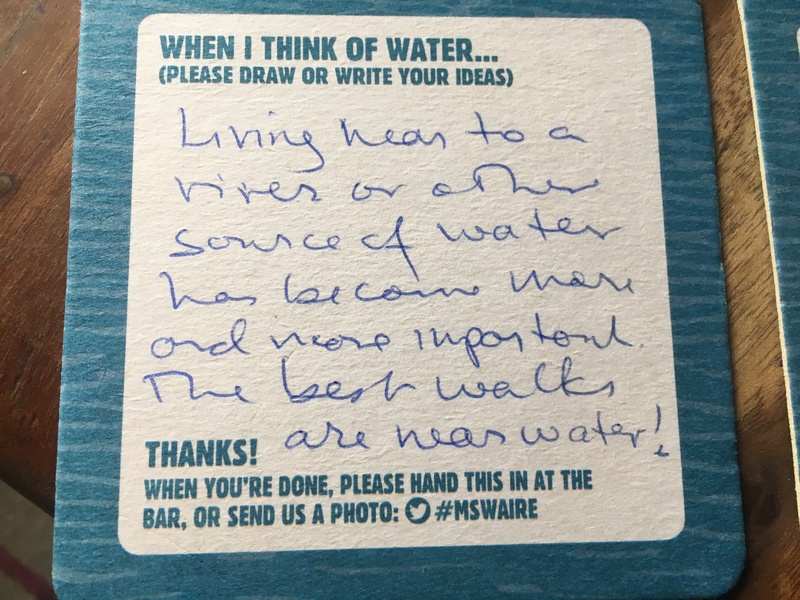 Whether it be issues of damp or problems with water supplies, InCommunities tenants experience water as one of the big negatives of their living conditions. Thankfully, the word “fire” does not appear. Yet. I should stress that I am not trying to say InCommunities does nothing right. Indeed early last week, a few days after the Grenfell fire, its Chief Executive Geraldine Howley (left) was awarded an OBE in the Queen’s Birthday Honours List, “in recognition of her services to housing, young people and the local community.” To earn this accolade, I’ve no doubt that Ms. Howley has done things at governance level that have made positive differences in people’s lives. And yet there is also, clearly, a serious disconnect between the management perspective and the perspectives of residents. So there’s an urgent need — in Bradford as well as in London — for constructive, respectful dialogue between authorities and tenants. 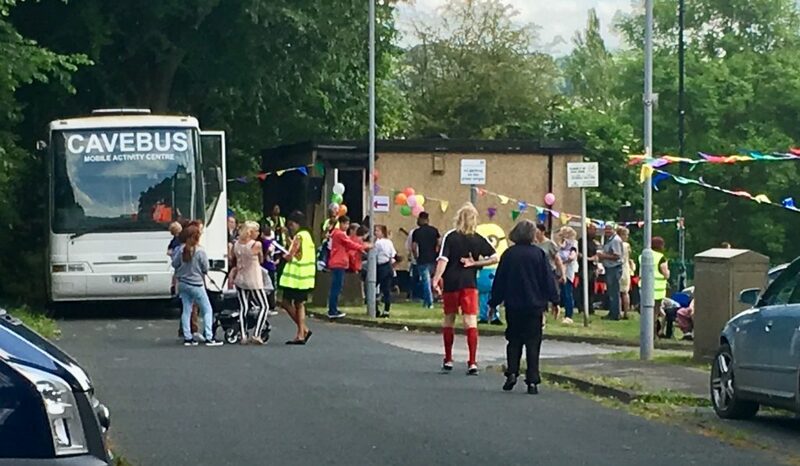 Perhaps that is just what InCommunities have been attempting this spring/summer, through a series of events and “walkabouts” they’ve set up on Bradford estates. At Crosley Wood, they laid on a well-attended “Fun Day” for residents on June 1st, which featured lots of music and bunting, free food and drink for residents (up to a point – when you’d had your allocation you had to pay for any more), as well as a caving bus, face painting and other family activities. There was also an information marquee offering advice on debt management, ways to save on household energy bills, and so on. 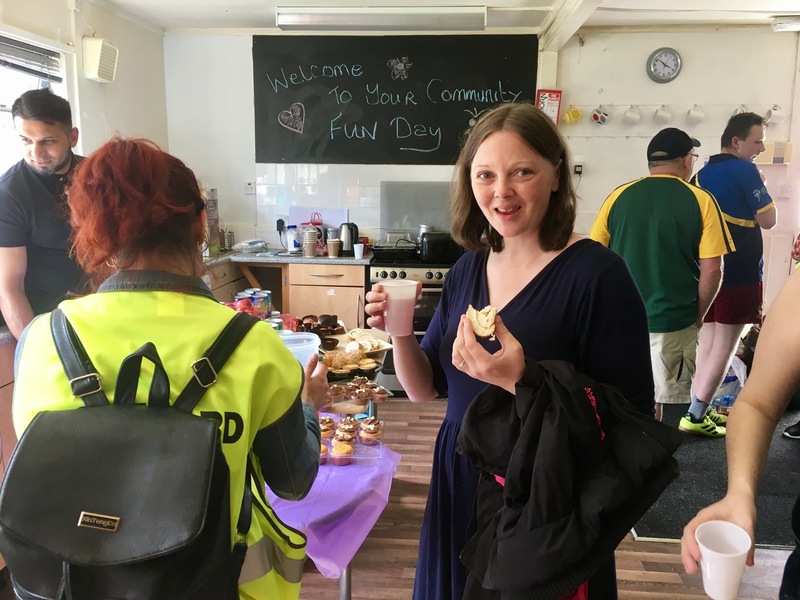 There seemed to be a real effort to engage with residents, particularly by the new housing officer Joanne, and lots of people clearly had a really enjoyable time. That rather bleak assessment, reflecting a wariness borne of experience, was echoed by others who attended the Fun Day. Lyze Dudley, who also took these photographs, spoke to numerous residents on the day, and while most were appreciative of what had been laid on, some of them also remarked that they didn’t understand what this event was for: were InCommunities really going to address their concerns, or was this just a PR exercise? “The feeling was”, Lyze wrote in her notes, “that this has happened in the past. There’s a nice event where free food and drink is given out, residents are asked for their opinions and then nothing changes. One resident informed me that she would rather they spent the money on repairs to the flats rather than a party.” Of course, repairs would cost a lot more than a party – and that’s exactly the problem. Social housing in this country has been chronically under-funded for decades. Another resident reported to Lyze his fears for the future of Crosley Woods’ portacabin community centre (rather peculiarly referred to as “the Kabin” in publicity for this event): “Joanne has informed him that they plan to change the locks on the cabin, essentially putting a stop to any of the sessions that currently run from here and taking ownership away from the residents who are taking responsibility for the cabin and have done for the past two years. Unfortunately he cannot tell me why or when this may happen.” It may be that this fear proves unfounded – let’s hope so. But unfortunately, the experience of Crosley Woods residents has in the past been of things being taken away from them, rather than provided to them. This was underlined most chillingly by Jenni, when I phoned her recently to see if she was concerned about fire safety, following the Grenfell disaster. “We used to have a really good fire safety system”, she told me: “We had heat detectors, smoke alarms, and a common alarm system for the entire block. So if a fire started somewhere, we all knew about it.” That system also sent an automatic alert to the fire brigade, who would then respond swiftly. However, after the building was renovated a few years ago (Jenni doesn’t recall the exact year, but the Conservative-Lib Dem coalition were in power), the alarm system was not replaced. Now, fire safety has simply become a private matter of residents’ individual responsibility. If your smoke alarm goes off, Jenni says, you have to decide for yourself whether to inform your neighbours or call the fire brigade. It’s all down to you. That about sums it up, doesn’t it? It’s an endemic problem in modern Britain that people are too often just left to fend for themselves. We are expected to be personally “resilient” in the face of crisis, and we shouldn’t necessarily expect any help from the authorities. The Grenfell fire exposed the murderous reality of what that means in practice, but it was — as the tower’s residents were well aware — an accident waiting to happen. As for Bradford, well… cladding problem or no cladding problem, attention must be paid. My thanks to Ruth Bartlett and Lyze Dudley for assistance with this post. We welcome comments, feedback and corrections. 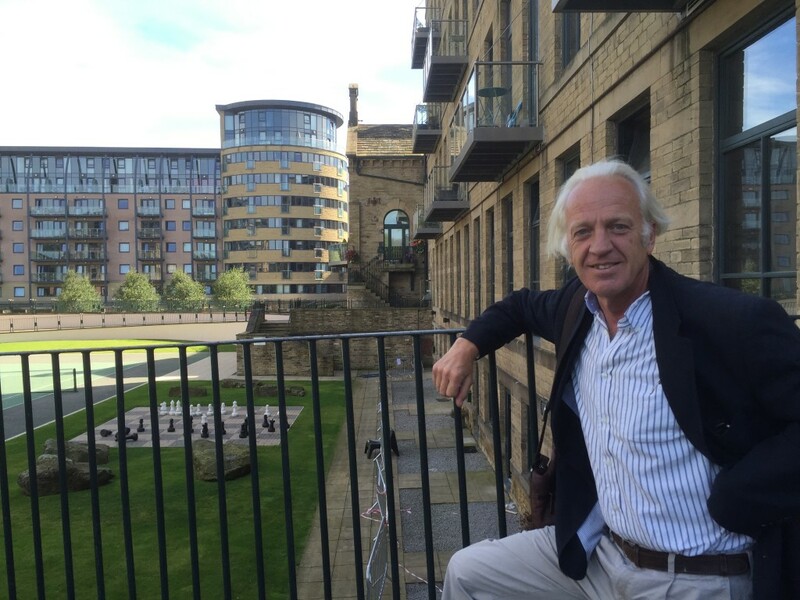 Andrew, who grew up in Shipley, is the property developer behind the Victoria Mills apartment complex on the south bank of the Aire, between Saltaire and Baildon Bridge. He built the place about a decade ago — converting existing mill buildings and also constructing from scratch three distinctive, curved apartment blocks: Northern Lights, to the left in the image above; and VM1 and VM2, in the background of the shot below, which stand on the bank of the river itself. 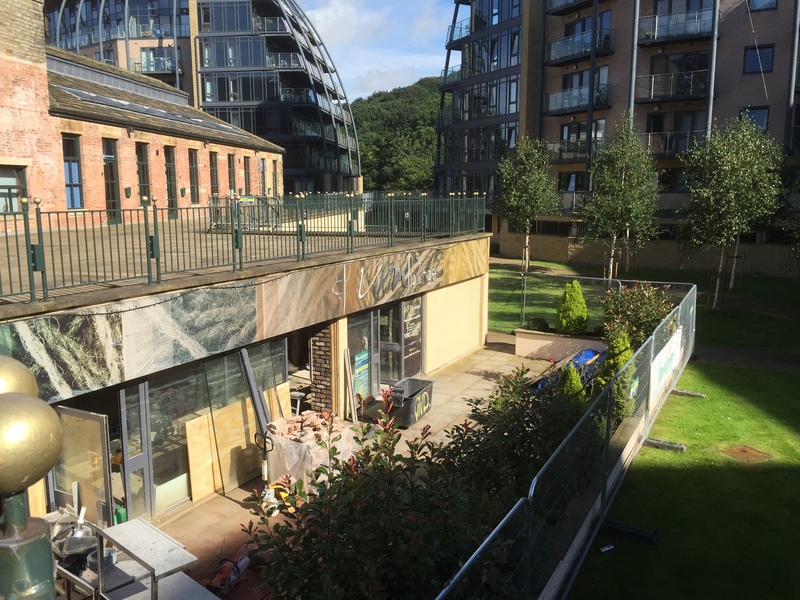 Victoria Mills was badly hit by the Boxing Day floods last year, and eight months on, the site is still in the process of rebuild and recovery. Actually, the first six months were occupied largely by endless debates with the insurance company, due to the extent and complexity of the damage, so the repair work only really began in the last couple of months. 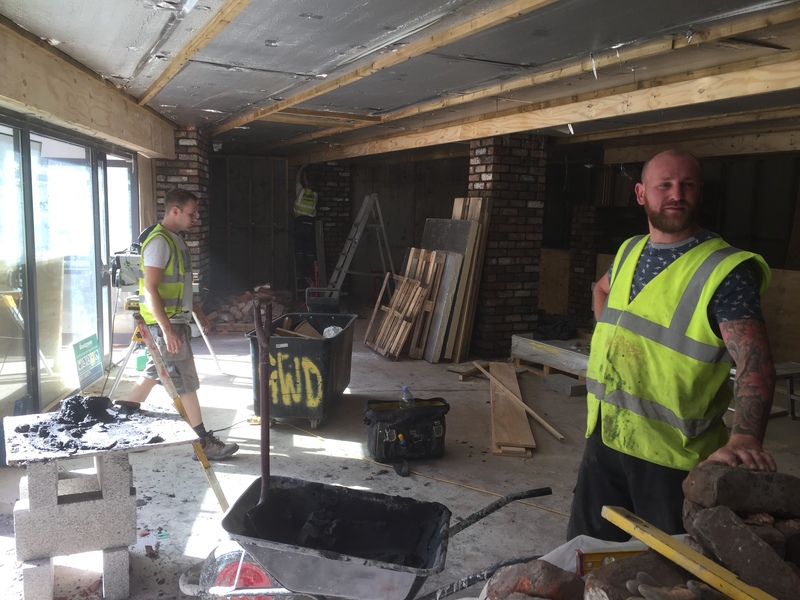 In these images you can see work continuing on the site’s bar, VM Lounge. As is apparent from the watermark on the windows in the shot below, the place was under 1.8 metres of water on Boxing Day. VM Lounge has been completely redesigned following the flood, and like other businesses and homes in the area, there’s been something of a learning curve… The refit will be consciously more “flood resilient” than the bar’s previous incarnation, in terms of its fixtures and fittings: the pillars below, for example, will be left as exposed (albeit coated) masonry in the new design, partly as “post-industrial chic” and partly because this will avoid the need ever to repeat the process of stripping away flood-soaked plaster from the brickwork. Despite this new eye to resilience, though, it’s important to note that VM Lounge and the grassy courtyard area it fronts onto were always designed and expected to flood in the development’s original plans. The rationale for putting the bar at this lower level was that, well, at least nobody lives there. If this gets wrecked, it’s less serious than someone’s home being impacted. What went wrong? Well, this picture above tells something of the story. The wall to the right (which supports the walkway from which I took the first shot above of VM Lounge) is a flood wall. It’s designed to store displaced water away on the other side, where the bar is, while keeping this grassy tennis court area safe and dry. So it was thought safe to install apartments at ground level in the block you see here (Masons Mill) and in the one facing it (Old Mill). It was these apartments that were hit on Boxing Day. Interestingly, though, the insurance company insists that these apartments (unlike the bar), were not “flooded”. Rather, they were affected by “a water inundation event”. The technical difference, Andrew tells me, is that flooding is what happens when the river flows into your property… whereas in this area the water came up through the ground. “Like something out of a science fiction movie”, Andrew remarks. Basically, the land in this area was so completely waterlogged during the flood that pressure from the swollen river pushed water up through the ground itself. The irony is that Andrew’s tennis courtyard was particularly vulnerable, because — in line with the best current design thinking — it was created to provide “sustainable urban drainage”; i.e. to let water sink down into the ground rather than it simply draining off impermeable surfaces and being channeled away elsewhere (back into the river). So for instance, the tennis court itself is made of “tenniscrete”, a form of porous hard surface that allows water down through it. Yet the twist here, of course, is that what goes down can also come up. The ground’s porosity also allowed water to rise through it. It’s an issue that, Andrew notes, nobody thought to raise when the Victoria Mills complex was being designed — not the architects, not the engineers, not the Environment Agency. And now it’s too late to do remedial work to solve the problem. All that can be done is to make those ground floor flats, like the bar, more resilient to future “inundation”. Although the setting for the estate is beautifully green and wooded, and right next to the canal, the buildings themselves are in a terrible state. Jenni and family had a “water inundation event” of their own only a few weeks ago, when the badly plumbed piping under the kitchen sink sprang a leak and deluged the floor, leaving them paddling around in several centimetres of water. 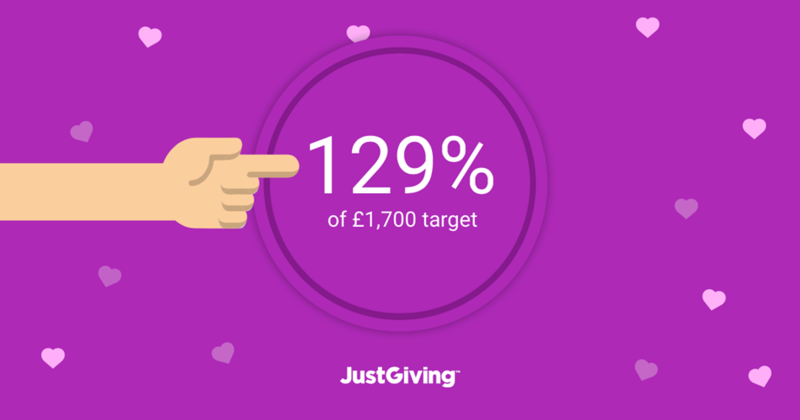 Jenni knows of almost identical incidents that have occurred in neighbours’ flats — and she has also had water pouring through her bathroom ceiling from a leak in the flat above. (Her own leak, of course, flowed down to the flat below… so there’s a kind of cascade effect – like an indoor waterfall!) But the real problem in terms of “living with water” in these buildings is the persistent damp from condensation in the external walls and in the walls around ventilation shafts. Dylan has lived his entire life at Crosley Wood, and has an asthmatic condition that his parents are convinced is related to the black mould spots on his bedroom wall. Yet every attempt that the Mynards have made to get In Communities to pay serious attention to the condition of the flat — or to relocate them to alternative accommodation — has fallen on deaf ears. I got to know Jenni and Dylan a little during recent visits to Crosley Wood’s regular Wednesday afternoon community meal (in the prefab hut that passes as a centre for residents). 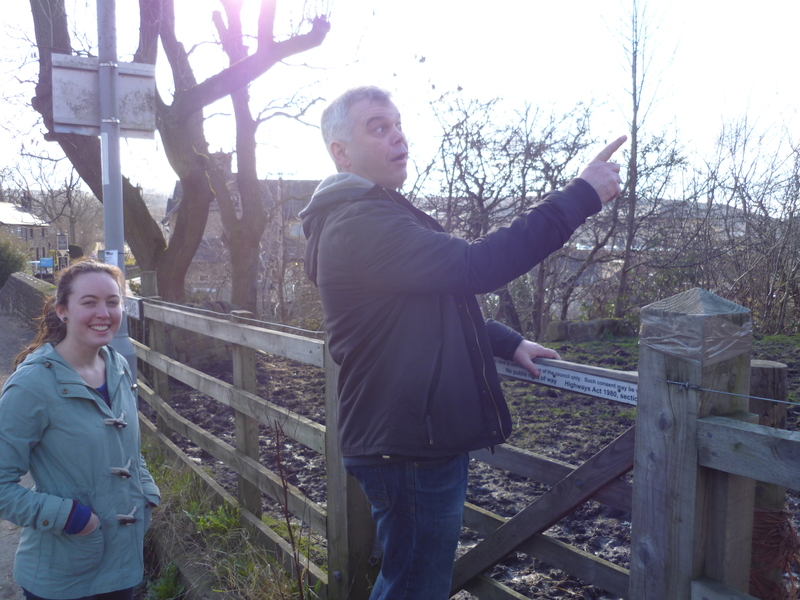 My colleague Lyze, and Paul Barrett of Kirkgate Centre, have been engaging with that group for some time now. I’ve been wanting, somehow, to reflect creatively on the circumstances that residents find themselves living in, and it occurred to me that Jenni’s story might make a good one focus for a short documentary film. She’s so passionate and articulate about their circumstances – and Dylan so sly and funny – that the film will require no editorialising commentary from me. 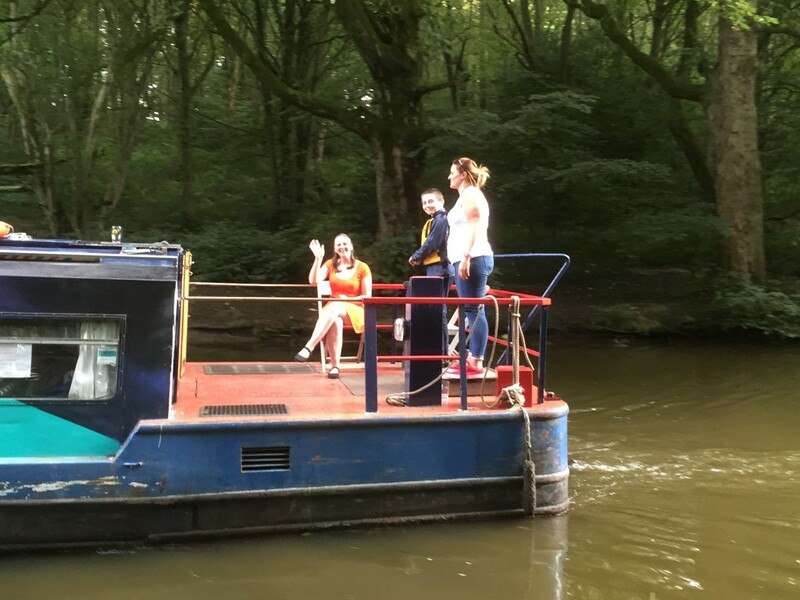 We spent two days this week shooting footage in and around Bingley, at Crosley Wood, and inside their flat — working from a rough outline plan that uses water as a connecting thread (from the Bingley Five Rise to the Crosley Wood ten-rise…). Maybe, just maybe, it will make somebody pay attention to their situation? I mention Sara in part because she’s now also a project partner. 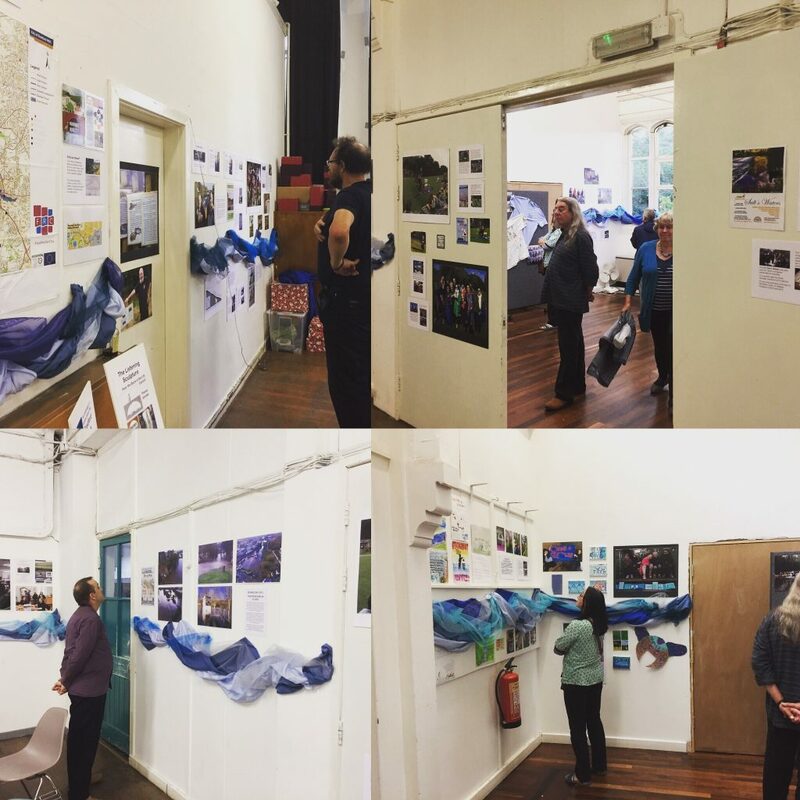 This year we’ll be beginning a new period of AHRC-funded research as part of a 3-year project titled “Towards Hydro-Citizenship”, with four case study areas: Shipley is one (carrying on where we left off last year), the area north of Aberystywith (Borth and Tal y Bont) is another, as are the Brislington area of Bristol and the Lee Valley in East London. 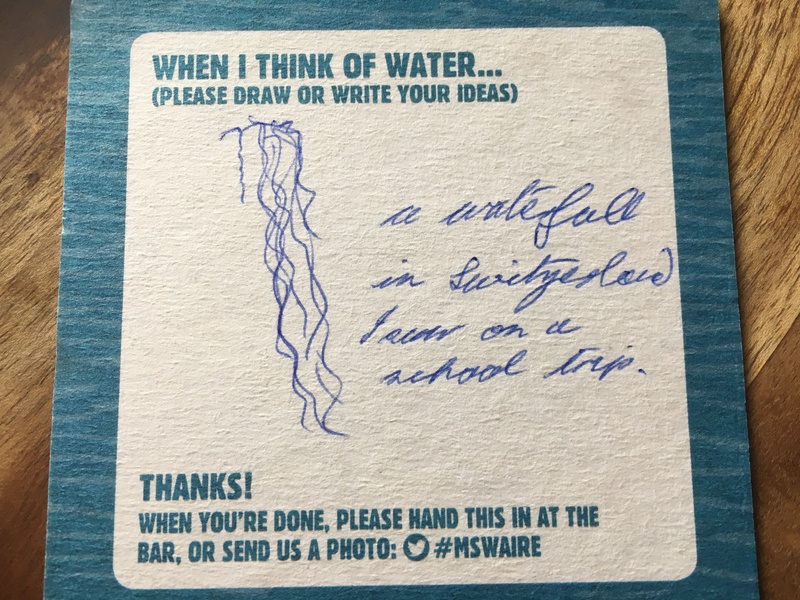 More on all this another time – suffice for now to say that in Shipley, we’ll be keeping the Multi-Story Water (MSW) name going because it has some local recognition. Just visible in this shot, competing a bit with the sunshine, is the easternmost tower of the Crosley Woods social housing development. Crosley Woods is right next to the canal, but on the “wrong side” for access to the towpath. To access the canal, residents have to walk down through a muddy field (there’s no footpath, but two – er – bathtubs) and exit through a gate with a sign explicitly reminding everyone that this isn’t a public right of way and that permission even to walk through the field could be withdrawn at any time by our friends at Bradford Council… Here are Maya Williams and Paul Barrett, of Kirkgate Community Centre, about to go through said gate (Paul is helpfully pointing our way up through the field to the estate). I was on a wee scouting trip with Paul and Maya, because Kirkgate Centre have been doing some community development work at Crosley Woods over the last year or so (although it’s technically in Bingley, not Shipley, it falls within the parliamentary constituency and thus falls within their remit). 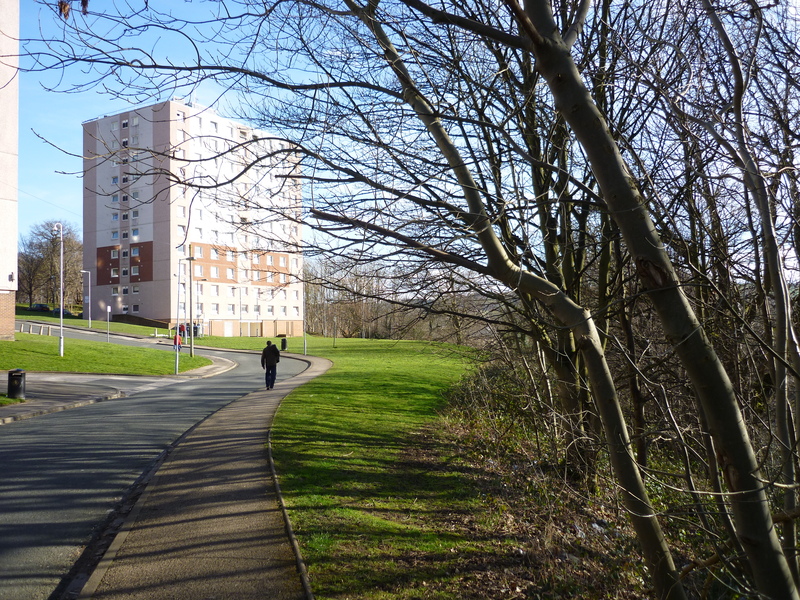 Initial survey work indicated that very few people had anything good to say about living in Crosley Woods, since (like many high-rise estates of this type across the country) there are significant problems with social deprivation, drug abuse, and so on. 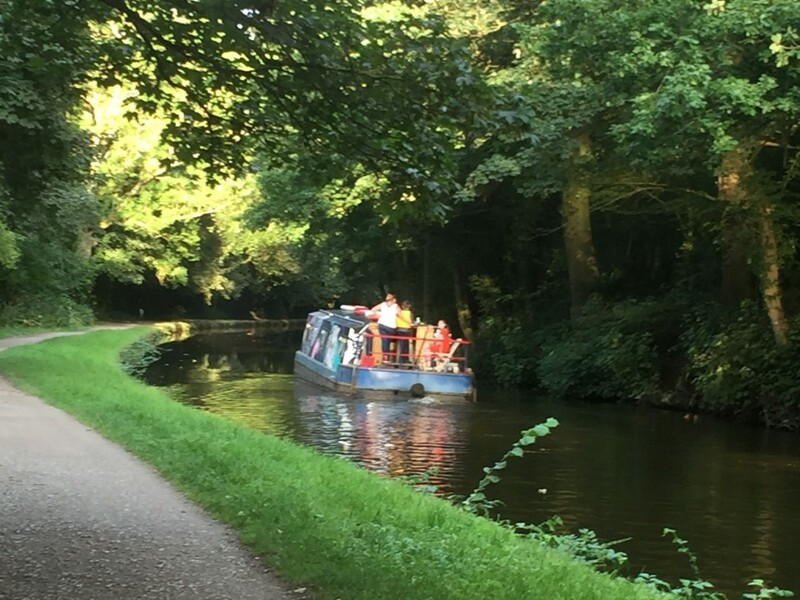 However, the one good thing that people highlighted was the proximity of the canal – a fact which prompted Paul to ask whether the definition of “Shipley” might be stretched to include Crosley Woods as we plan the next stage of our water-focused activities. 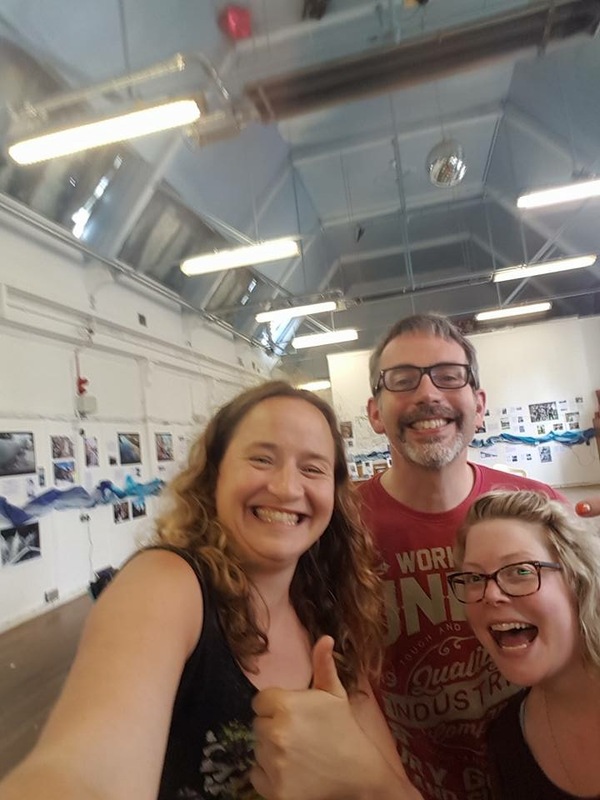 The MSW project will be working directly in collaboration with Kirkgate Centre over the next 3 years, so we’re looking at points of common interest and concern… hence this week’s visit. 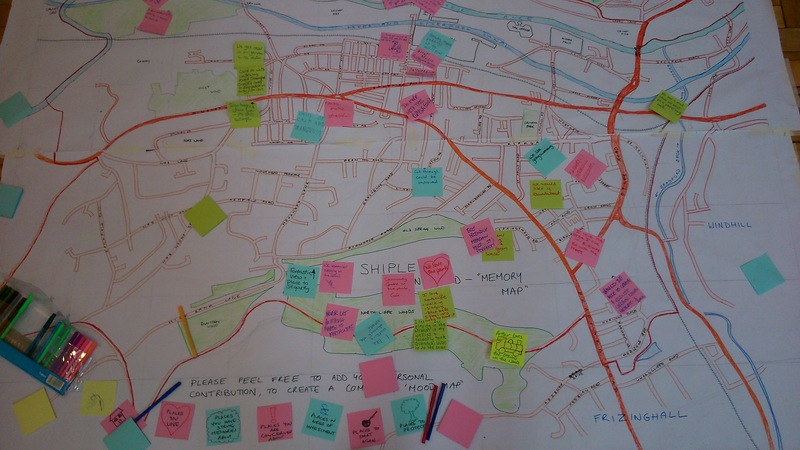 Although Shipley Connected was conceived and run by Kirkgate with no directly intended link to the MSW project, it was great to get involved by way of further developing an emerging relationship that we all hope will be productive in the coming years. 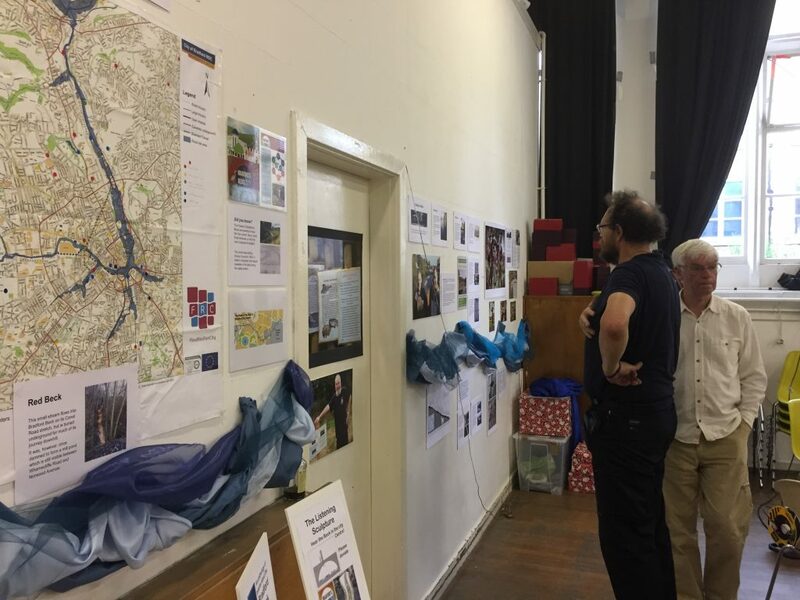 As Paul notes, many of the neighbourhoods in Shipley that need particular attention in terms of community development are also proximal to the river or canal, so it’s a natural fit to think in terms of using water as a kind of creative theme to hinge future work around. Litter is an ongoing issue – not least the kind of stuff that gets wrapped around trees after high water and is left looking very unsightly. This is something that would take concerted effort from local volunteers to take care of, if the Council doesn’t take responsibility. Future of local weirs. The argument about the potential Saltaire Hydro was referenced but nobody really wanted to get into it (old news?). 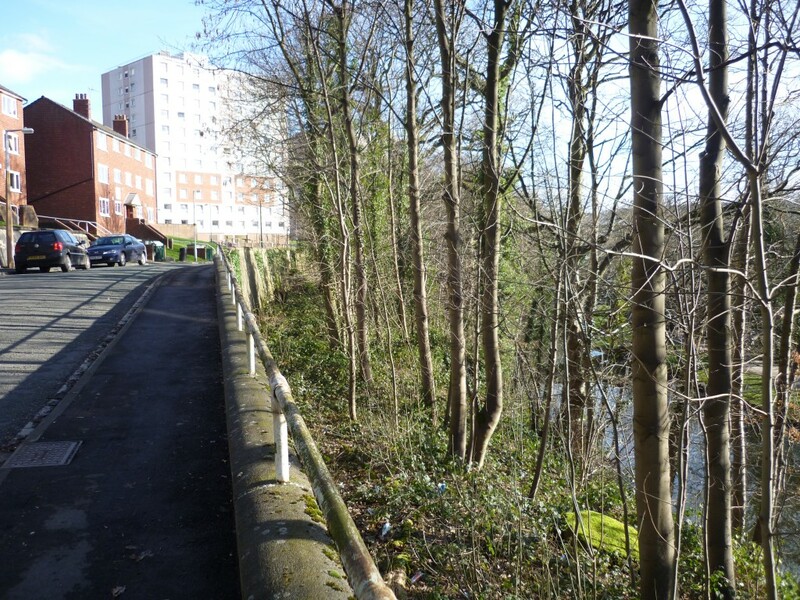 There was discussion though about the costs or benefits of weir removal… One person raised concerns about the silting up of the river at Roberts Park, and wondered whether the presence of the weir was in part to blame for this (sediment building up on the upstream side). There was also some discussion of taking out the weir by Baildon Bridge (see this blog for fuller discussion). It probably wouldn’t greatly improve the health of the river or access upstream for fish (since there are two more weirs just upstream), but there is also the flood risk argument. Boats on river? 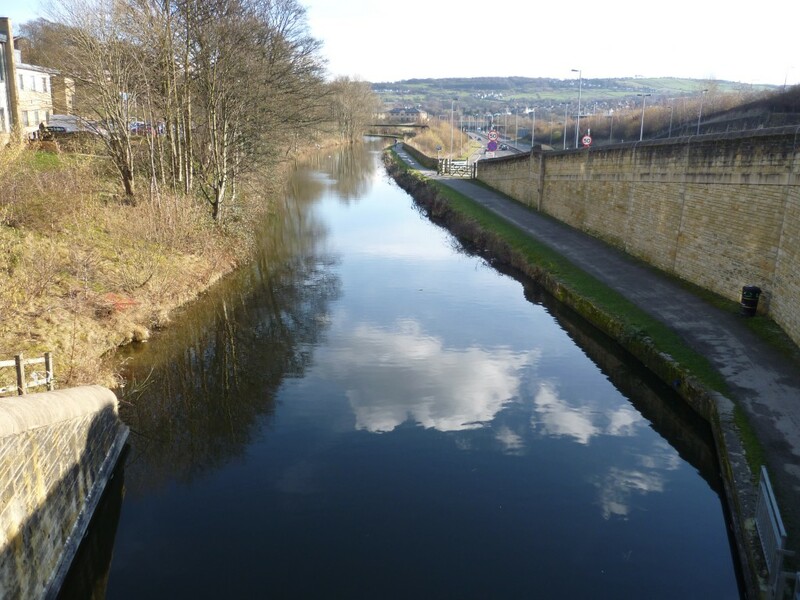 There was discussion by some of those with longer memories about the days when boats could be hired at the Boathouse and rowed recreationally between the two weirs at Saltaire and Hirst Wood. Is there value in campaigning to get this back up and running? Develop Bradford Beck recreationally. 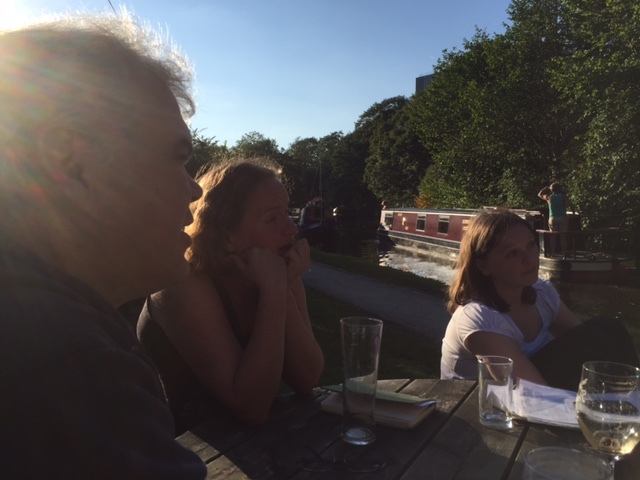 This is of course very much a priority for the Friends of Bradford Beck (whose chairman Barney Lerner was present for the discussion), and everyone agreed on the value of trying to make the Beck more accessible… development of cycle path and footpath, clean-up, etc. Japanese Knotweed and other non-native plant species. 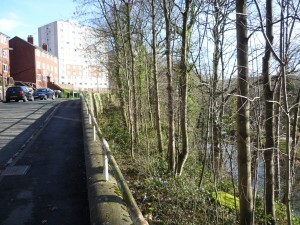 These troublesome riverside invaders were raised by one participant, and Barney spoke very encouragingly about FoBB’s plans to train up some volunteers in the art of injecting weedkiller into the roots of invasives… The plan is to tackle this problem along the open-air sections of Bradford Beck, but also at trouble spots on the Aire (such as the area upstream of Baildon Bridge). I think those were the main points people raised. (Interestingly, nobody really had any issues with the canal.) It was great to have Barney and other BB “friends” present, and I’m hoping MSW will also be able to work in an active, complementary way with them in the next few years. They’re doing great work!